When I saw this item about Fannie Cleage, I chose her for F. There was a Fannie mentioned in the 1834 letter to the Overseer by Samuel Cleage’s, however this Fannie was not born yet, so that was not her. In the 1900 census in Knoxville, Tennessee she was listed as a servant for the Hood family. The head of the family, WM Hood was a 47 years old merchant and had been married to Estela 32, for three years. Fannie was 65, a widow who had given birth to 3 children, all now dead. She was able to read and write. 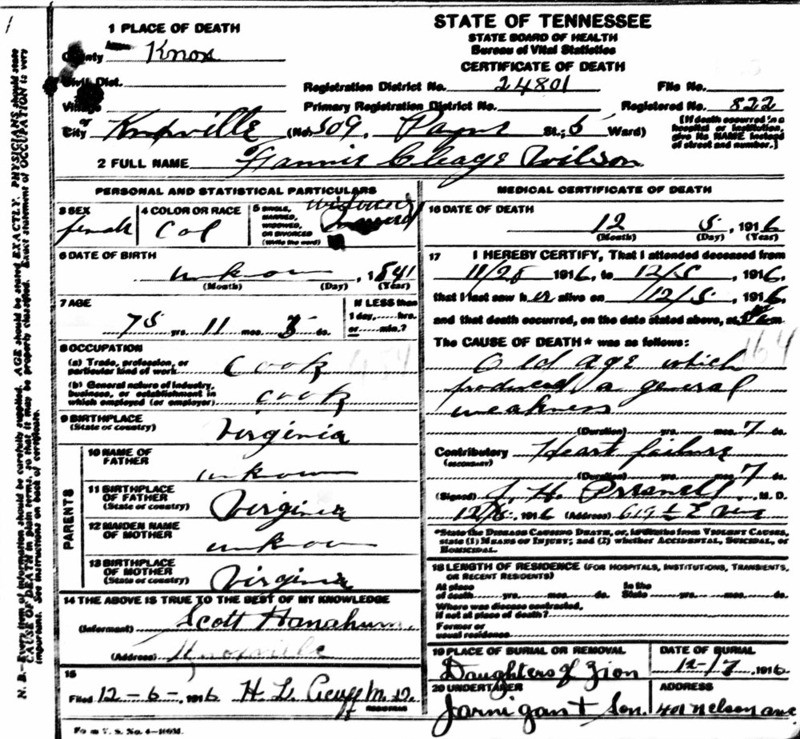 Fannie Cleage’s death certificate says that she died of old age, general frailty and heart failure. She was a widow, 75 years old and had worked as a cook. She was buried Daughter’s of Zion Cemetery. Afterward: My mother wanted to name me Fannie, after her mother Fannie Turner Graham. My grandmother told her not to do it. I was almost Fannie Cleage. If I had seen the title of that article while looking for Fannie Cleage, I would have skipped it because “Cook” also sounds like a surname. Why would the newspaper choose to highlight that part of her life anyway? You don’t have to answer that. It was a black newspaper so I don’t think it was racial stereotyping. Perhaps she was quite famous as a cook, that was her skill. She must have been, why else would a newspaper out of Chicago give her any space at all. I just wish I could have found some of her recipes or a longer obituary. oh, and I had searched for “Cleage” so I was looking for that. This is an interesting theme. I’m sure if I looked into my family name: Finney, it would be eye-opening. I’m pretty lucky that Cleage’s in Athen’s TN and surrounding areas stand out. Finney’s might be harder. I knew a Melanie Finney. They ended up naming me Kristin after the novel by Sigrid Undset, Kristin Lavransdatter. I’m the only Kristin in the family so far. I just read through all of your posts here for the A to Z this year. What an amazing journey. I’m so happy you’re sharing it with us. I see so much you could create a story for a novel around. I like your name Kristin, and like Fannie too. Thank you for visiting my blog and commenting. I’ll be back! That is what I’m thinking too. I’ll have a full cast by the time I get to Z. 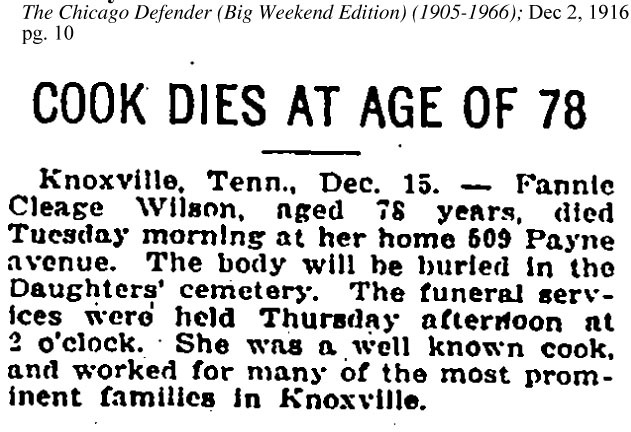 It is pretty weird that they would say “Cook dies” at the top of her obituary. Was she that great/famous of a cook? Finding some recipes would have been truly fascinating. Maybe it was a slow news day. Maybe she was THAT good. I never thought it was strange when I found it. I was just happy to find another Fannie because I had already used one Fanny Cleage earlier when I wrote about her and husband Isaac before I knew I was going to do this for A-Z. Fannie Cleage, an unsung fabulous cook… She will be a central character when I fictionalize this. I have noticed in memoirs, letters, diaries, etc., the cook is often mentioned. A good cook was an essential member of the household. The community would have known of Fanny’s skills because many would likely had an opportunity to sample her cooking when visiting the prominent homes where she worked. Thank you Linda! And maybe she cooked at community events too, such as church dinners, where even more people would of sampled her good cooking. I hope she knew she was appreciated when she was alive and that she did have a community of friends to take the place of her missing husband and children. Like most good cooks, she probably worked without recipes. But it would be interesting to find out what sorts of things were popular at that time, what she would have been cooking! A fascinating fragment. That’s true, about the recipes. But it would be interesting to find out what dishes were being eaten in Knoxville. Another research area to plunge into. You are getting to those Tennessee Roots! Now I got to see if I can find Payne Avenue and that Cemetery. Great Start! I’m slow but enjoying! Everything is so prolific. I only got to get oral recipe from one of my Mom’s deserts. I’m realizing now I only know them by heart the rest of them. Not written. I have to make time. That link will take you to more information about the cemetery. Yes, take the time and write those recipes down! Take your time, enjoy! These posts will be here.